Over the last decade, the United States' position as the world's most powerful state has appeared increasingly unstable. The US invasions of Afghanistan and Iraq, non-traditional security threats, global economic instability, the apparent spread of authoritarianism and illiberal politics, together with the rise of emerging powers from the Global South have led many to predict the end of Western dominance on the global stage. This book brings together scholars from international relations, economics, history, sociology and area studies to debate the future of US leadership in the international system. The book analyses the past, present and future of US hegemony in key regions in the Asia-Pacific, Latin America, Middle East, Europe and Africa – while also examining the dynamic interactions of US hegemony with other established, rising and re-emerging powers such as Russia, China, Japan, India, Turkey and South Africa. 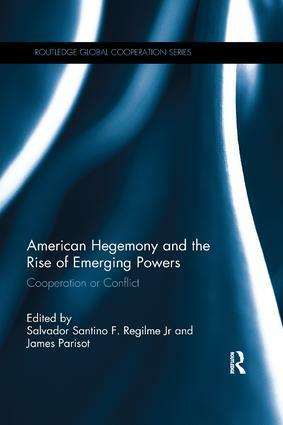 American Hegemony and the Rise of Emerging Powers explores how changes in the patterns of cooperation and conflict among states, regional actors and transnational non-state actors have affected the rise of emerging global powers and the suggested decline of US leadership. Scholars, students and policy practitioners who are interested in the future of the US-led international system, the rise of emerging powers from the Global South and related global policy challenges will find this multidisciplinary volume an invaluable guide to the shifting position of American hegemony. 3. Financial centres and RMB internationalization: prospects for a post-American monetary order? Salvador Santino F. Regilme Jr is an Assistant Professor of International Studies at the Institute for History at the University of Leiden, the Netherlands. He holds a joint PhD in Political Science and North American Studies from the Free University of Berlin, Germany, and he previously studied at Yale, Osnabrück, Göttingen and De La Salle Manila. James Parisot received his PhD in Sociology from Binghamton University, USA, and is part-time Faculty in the Department of Sociology at Temple University, USA. He has published articles in journals including, among others, Third World Quarterly, International Critical Thought and the Journal of Historical Sociology. The Routledge Global Cooperation series develops innovative approaches to understanding, explaining and answering one of the most pressing questions of our time – how can cooperation in a culturally diverse world of nine billion people succeed? We are rapidly approaching our planet’s limits, with trends such as advancing climate change and the destruction of biological diversity jeopardising our natural life support systems. Accelerated globalisation processes lead to an ever growing interconnectedness of markets, states, societies, and individuals. Many of today's problems cannot be solved by nation states alone. Intensified cooperation at the local, national, international, and global level is needed to tackle current and looming global crises. This interdisciplinary series welcomes proposals from a wide range of disciplines such as international relations and global governance, environment and sustainability, development studies, international law, history, political theory or economy which develop theoretical, analytical, and normative approaches concerning pressing global cooperation questions. We favour books that take an interdisciplinary approach and appeal to an international readership comprised of scholars and postgraduate students. Tobias Debiel, Claus Leggewie and Dirk Messner are Co-Directors of the Käte Hamburger Kolleg / Centre for Global Cooperation Research, University Duisburg-Essen, Germany. Their research areas are, among others, Global Governance, Climate Change, Peacebuilding and Cultural Diversity of Global Citizenship. The three Co-Directors are, at the same time, based in their home institutions, which participate in the Centre, namely the German Development Institute / Deutsches Institut für Entwicklungspolitik (DIE, Messner) in Bonn, the Institute for Development and Peace (INEF, Debiel) in Duisburg and The Institute for Advanced Study in the Humanities (KWI, Leggewie) in Essen.